Wahoo! A new way to play with your dog. This 6 week class is designed to bring smiles and wags to pet dogs and their owners. There is a solid emphasis on relationship, teamwork and joy for the dog/handler team while providing meaningful training challenges using a combination of classic obedience and herding cues. This will give energetic dogs much needed mental and physical stimulation but does not put any physical stress on the handler. It also builds confidence for the shy dog. It is a great class for any dog that loves to play chase games, to herd, or just use their amazing problem-solving ability. 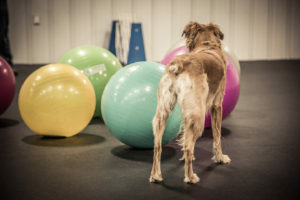 Visit our Wag It Games Class Calendar for start dates and session status.